Disc-ff now supports linking your steam account with your forum account, and it is recommended that you do this when you can, as it takes less than a minute. Note: While normal users are not REQUIRED to link their steam account, admins and admin applicants are. 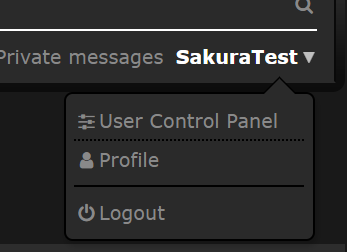 Linking your steam account is simple, and can be done by logging in to your forum account, then clicking your name in the top right corner and selecting "User Control Panel". You will see a tab called "Link Steam Account". You can also access this page with THIS LINK. If you have either registered with a steam account or have already linked your steam account, this tab will not show up and you will get an error. Just click the "return to index page" link on the top right corner to return to the forums. After access the "Link steam account" tab, you will see a button that says "Connect using steam". This button might not load right away, so wait a second or two if you do not see it. If you still do not see it after about 10-20 seconds, try refreshing the page. If that still does not fix it, your browser might not support it, and you might need to try another. When you click on this button, a new window should open up, bringing you to steams login page. If you are already signed into steam in your browser, it will show your account with a "Sign In" button underneath. All you need to do is click that button to sign in. If you are not already logged in to steam in your browser, you will need to log in at this time. After signing in, the window should close, and you will be redirected to the forum index page. If you see any errors then something went wrong. Otherwise, your account is now linked and there is nothing left to do. Note: At no point do we ever get access to your login information. The only information we get back from steam when you log in this way is information about your profile, such as username, avatar, steam ID, etc, and an OpenID identifier, which is a special key that is used to validate your account, and is unique to this website, so even if someone had access to that key, they could only log in to this website, and not any others using steam. Important: Do not log out of your account and log back in with steam if you have not linked your account yet. This will create a new account with your steam linked, and you can not link your existing account with your steam anymore. If you have already linked your steam account, this will work and you do not have anything to worry about. Last edited by SakuraTheBabyfur on Sat Feb 17, 2018 9:26 pm, edited 2 times in total.